White flowers, VIII–IX; light yellow foliage throughout the year; open erect habit; height 26–30cm; spread 31–45cm. Raised by J. Proudfoot (Almondell Nursery, Methven, Perthshire, Scotland) by 1989. Semi-double deep cerise flowers, VIII–X; yellow foliage throughout the year; compact; height 21–25cm; spread 31–45cm. White flowers; VIII-IX; foliage a good deep yellow; habit erect; height 20cm; spread 45cm. It was found as a seedling by John Proudfoot in his nursery garden at Melven in 1989. 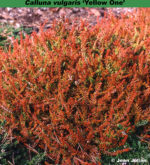 Mauve flowers, VIII–IX, sparse; yellow foliage turning orange-red in winter; cushion-like habit; height 10–15cm; spread 16–20cm. It was found as a seedling near 'White Lawn' by Mr T. Huisman at Hattem, Holland. Introduced by H. W. de Bruijn of Boskoop in 1990. Pink flowers, IX–X; yellow foliage in summer becoming red in winter; height 26–30cm; spread 31–45cm. Found by David McClintock (Bracken Hill, Platt, Kent, England) about 1965. Flowers white; VIII-IX; the foliage yellow. Introduced by Lieutenant-Commander (retd) R. M. Steele (Rose Bay, Lunenburg, Nova Scotia, Canada) before 1999. Originally named 'Steele' by G. &. E. MacKinnon (Waquoit, Cape Cod, Mass., U.S.A.), but that name is rejected. White flowers, VIII–X; bright yellow foliage; robust, upright; height 26–30cm; spread 46–60cm. 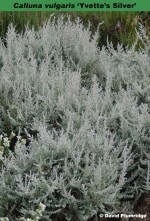 Lavender flowers, VIII–IX; grey foliage; vigorous, upright habit; height 31–45cm; spread 46–60cm. Named after Yvette Knutson, a one-time employee of David Wilson (British Columbia, Canada). Mauve (H2) flowers, VIII–IX; dark green foliage; attractive compact habit; height 31–45cm; spread 46–60cm. Found by Herbert Mitchell (Helmsley, Yorkshire, England); introduced by Mitchell in 1972. Named after finder's 10-year old niece, Yvonne Wilson, who helped in the nursery.